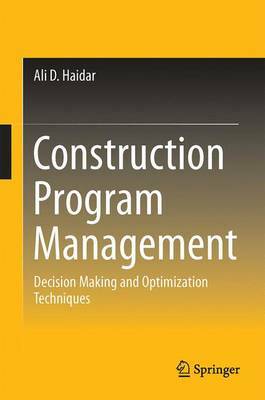 Exploring complex and intelligent analytical and mathematical methods, this book examines how different approaches can be used to optimize program management in the construction industry. It presents an in-depth study of the different program management methods, ranging from simple decision-making techniques and statistics analysis to the more complex linear programming and demonstrates how knowledge-base systems and genetic algorithms can be used to optimize resources and meet time, budget and quality criteria. It addresses topics including decision-making principles, planning and scheduling, mathematical forecasting models, optimization techniques programming and artificial intelligence techniques. Providing a valuable resource for anyone managing multiple projects in the construction industry, this book is intended for civil and construction engineering students, project managers, construction managers and senior engineers.